ACI is a leader in custom cylinder design and manufacture including the use of stainless and other exotic materials. Look to ACI to deliver functional equivalents of OEM cylinders and to develop innovative new designs using new technologies. Segmental and multi-piece pistons; wet, dry, and slip-fit liners; ExactoTorque™ locknut; proprietary and OEM equivalent replacement valves; and new plate and poppet valves. Bring new life to older compressors with ACI EnviroLine® Products. You will waste less and deliver more gas. An online database of equipment and a perfect way for companies to sell used equipment, excess stock and equipment that has been retired. 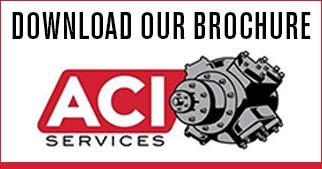 Compressor Connection is a service of ACI Services, Inc.
ACI offers a line of volume and bypass Unloading Devices. ACI also supplies a range of actuators for reduced volume demands, variable operating pressures, and reduced discharge pressures. ACI offers pulsation dampening devices which help increase flow rates, increase revenue and eliminate unnecessary wear and tear on reciprocating compressor packages.